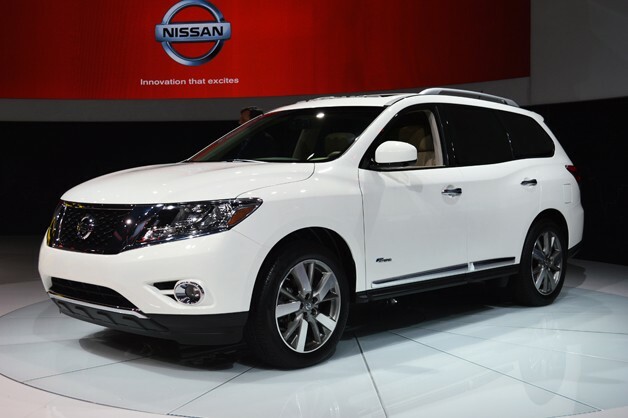 Nissan has just announced pricing for the 2014 Nissan Pathfinder, which appeared last year as an allnew version for 2013. In addition to a Pathfinder hybrid, the line grows by a couple of trim choices with the twowheel drive Pathfinder S now starting at 545, $ 29 and the drive Pathfinder S starting at $ 31, 145. In the very top of the range is the Pathfinder Platinum fourwheel drive, which is anticipated to sell for around $42,045. A total of eight Pathfinder models will be provided for the 2014 model-year, with four fourwheel drive ones and four twowheel drive models. Towing capacity is 5,000 pounds around the range, and drivers within the fourwheel drive versions are able to pick twowheel drive automobile or fourwheel drive lock modes using a dial. All versions now come with Nissan's 3.5liter V6, in another timely nod to the auto-buying people's demands of today, and also the hybrid version is going to be available for sale in the autumn. For 2013 the Pathfinder traded its bodyon - frame building in favor of a structure, a transfer created by many SUVs which have morphed into crossovers over time in reaction to market demand for softer management and a bit less brawn. Fuel economy in the 2013 model was a decent 19 milligrams city and 25 mpg highway, which is in accordance with the contest. We were less impressed with the plastics in the 2013 model dominating the dashboard, along with the resolution of the display, which we felt should have been a little more in keeping with the times. But we enjoyed the flexibility of the EZ Flex seating system with Glide and Latch, a layout that provides the Pathfinder, which seats seven passengers, a fast way to stow the additional seats. Overall, we found the 2013 Pathfinder to have been quite a luxury as it will have been - - ride. Gone are the days of bodyon-frame SUVs it appears, as last year the Pathfinder joined the ranks of the Ford Explorer as it reinvented itself as a more civilized softroader, with an interior you can simply find in a luxurious sedan just 15 years ago. Not that anyone's whining, as we found the bodyon-frame trucks had maybe overstayed their welcome given the realities of daily usage in urban and suburban settings.